(Corpus Christi, TX December 6, 2017) –Multiple GRAMMY® Award winner Jason Mraz has announced plans for a 17-city live tour. The dates – dubbed “An Evening With Jason Mraz, Solo Acoustic” – begin Thursday, March 8th at Raleigh, NC’s Raleigh Memorial Auditorium and then continue through the month (see attached itinerary). Fan pre-sales begin Thursday, December 7 at 12pm – 10pm use password JASON; with tickets to go on sale to the general public starting Friday, December 8th at 10:00am. For complete details, and ticket information, please visit jasonmraz.com/tour and www.americanbankcenter.com . Today’s tour announcement follows the recent news that Mraz will be extending his Broadway debut run in the hit musical, Waitress, with performances now scheduled through January 28th. The two-time GRAMMY® Award-winner will be joined from January 16th by Tony and GRAMMY® Award-nominated Waitress composer Sara Bareilles, making her long awaited return to the production. Mraz and Bareilles have a long history of collaboration, having previously teamed with for two songs on 2015’s top 10 album, “WHAT’S INSIDE: SONGS FROM WAITRESS.” For complete details and ticket availability, please visit waitressthemusical.com. In other news, Mraz has co-written and performed a new original song, “Can’t Hold Out On Love,” to be featured in the upcoming Warner Bros. feature film, Father Figures, arriving in theaters nationwide on December 22nd. 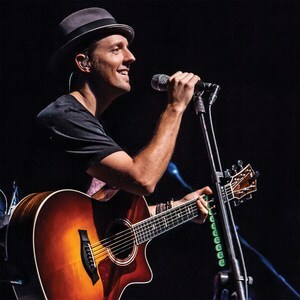 Mraz recently celebrated the 15th anniversary of his RIAA platinum certified major label debut album, “WAITING FOR MY ROCKET TO COME,” with the album’s first-time-ever vinyl release. The “WAITING FOR MY ROCKET TO COME” double LP is available now on standard black vinyl at all music retailers carrying vinyl records (see here); an orange vinyl edition is exclusively available via Barnes & Noble. All vinyl editions feature expanded artwork by Robert Fisher and Alison Dyer, plus lyrics and new liner notes by Mraz. Jason Mraz has quietly amassed a diverse fan-base throughout all parts of the globe. Since getting his start in coffeehouses in San Diego, Mraz has brought his positive message and soulful, folk-pop sound to rapt audiences around the world through his vibrant recordings, humorous live performances, and philanthropic efforts. Along the way, he has earned numerous platinum certifications for his various releases, made pop history with his record-breaking classic single, “I’m Yours” and “I Won’t Give Up”, racked up 2 Grammy Awards, won the prestigious Songwriter Hall of Fame Hal David Award, has sold out amphitheaters and arenas across the globe, including sell-outs at The Hollywood Bowl, Madison Square Garden, and London’s O2 Arena. For more, please see www.jasonmraz.com and www.atlanticrecords.com.